Leather, Vinyl, Fabric, Carpet, Cloth, Velour, Wood Grain, Hard Plastic. 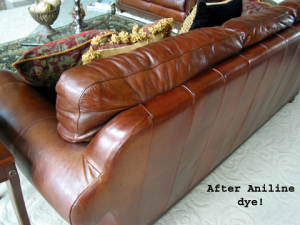 Color Glo specialists are available to help restore, clean, condition, repair or re-dye your valuable property. Color Glo specialists use non-flammable, odourless, water-based products that dry quickly. This allows us to offer a safe on-site service for your convenience. This eliminates the downtime and cost of transport. Our work is permanent and environmentally safe. 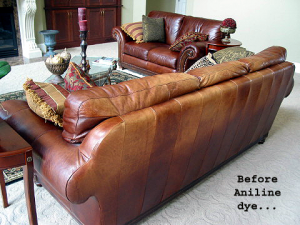 Color Glo specialists use non-flammable, odourless, water-based products that dry quickly. Our ISO Certified products and process mimics the factory and has been proven in independent testing to last as long and often longer than factory finishes. Color Glo is the only developer and manufacturer in the world of leather refinishing products to have been awarded ISO Certification. Providing our customer a guarantee of a quality lasting finish and extended life for their furniture. At Color Glo we do not work to set colours. We specially train our technicians in colour mixing, matching and blending so when completed our work matches exactly the required colour. This also allows us to do even the smallest areas of colour loss minimizing the cost of restoration to our customers.